FILE - Inmates are seen exercising in the main yard at California State Prison in Vacaville, California, May 20, 2015. Thousands of inmates have since petitioned to have their sentences revised under the guidelines and the first wave of prisoners ­estimated at close to 6,000- are set to be released by November 1. 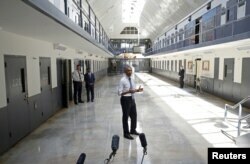 Most of them have already completed their sentences and will be released from halfway houses or home detention. According to the non-profit organization, Families Against Mandatory Minimums, offenders eligible for a reduction could have their sentences reduced by an average of just over two years, serving nine years sentences, on average. The United States is the world's largest jailer accounting for nearly 25 percent of the world's prison population despite making up just less than five percent of the world's population.